Many employees are wrongly perceiving that having an active lifestyle outside of the workplace negates the ill-effects associated with sedentary behaviour at work, researchers have found. A study conducted by Deakin University in Australia asked 222 desk-based workers and 121 managers in Melbourne to rate the healthiness of various combinations of sitting and physical activities during work and leisure time, ranging from uninterrupted sitting to “moderate to vigorous” exercise. The research, which has been published in the Occupational Medicine journal, found that physical activity in recreational time was perceived as “healthier” than activities taken part in an occupational setting, and that “moderate to vigorous” activity at work was regarded as more arduous or hazardous than exercise outside of work. If a scenario included being physically active outside of work, the employee was less likely to consider the detrimental effect of workplace sitting alongside it. 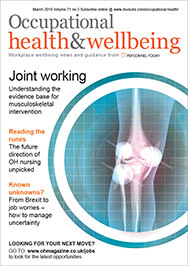 On the whole, participants were more concerned about the effect prolonged sitting would have on musculoskeletal conditions and work performance than its contribution to chronic health conditions, such as diabetes, heart disease and strokes. The researchers described workers who are physically active outside of work but sedentary during working hours as “active couch potatoes”. They found that most workers perceived the “active couch potato” lifestyle as healthy, despite the risks associated with sitting at a desk for long periods of time. Study author Dr Alexander Mussap said: “There is a common yet incorrect belief that prolonged workplace sitting is not problematic if a person is physically active during their recreational time. Research published by Fellowes last month found that office workers spend on average 67 sedentary days at their desks per year, with 81% of staff spending between four and nine hours a day sitting down.